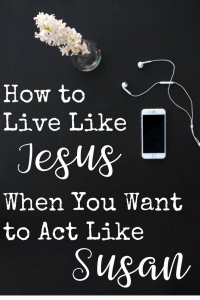 This post, How to Live Like Jesus When You Want to Act Like Susan, contains some affiliate links for your convenience. This means if you make a purchase after clicking a link, I will earn a small commission at no additional cost to you. Read my full disclosure policy. Y’all. My tribe has a had a ROUGH few months. I’m talking physical illness, a drug overdose, threats received, arrests, hospitalizations, false accusations made, two cars totaled, friendships lost, three deaths, two leaky roofs, and the hits just keep on coming. And while I’ve done my best to behave in a way that honors God, it has still been a super hard journey. Honestly, it’s probably been harder because I’ve been trying to behave like a Christian and live like Jesus. There are have been many days I’ve wanted to act petty and messy and mean and spiteful and then ask for forgiveness. Because I know I’d get it from God and He’s the only one that matters right? In fact, the way that Christians handle themselves during adversity reveals way more about their faith than how they behave during times of smooth sailing. It’s easy to be meek and righteous when everyone is kind to you, but when someone is lying about your best friend, your husband is in a roll over car accident, and the bank won’t refund the fraudulent charges made on your debit card… the claws want to come out. Or maybe you get overwhelmed when things start crashing down around you and you doubt yourself. It’s like after a car wreck that you know wasn’t your fault, you still think of ways the accident might have been avoided. In reality it wasn’t your fault, and while improved dental hygiene is always a plus, you couldn’t have stopped tragedy from befalling you. Still, you may doubt yourself. Your friends may doubt you, too. 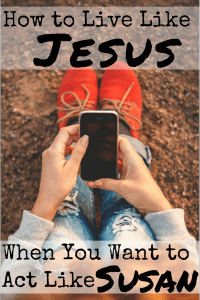 So how can you know if you’re behaving like Jesus or Susan? *Side note: if your name is Susan, I mean no offense here. I think Susan is a great name. I’m just using the name Susan as a placeholder for every single human name out there. Because we are all fallible and none of us live up to the standard that Jesus set. We all good Susan? This isn’t a list of steps to check yourself. God gave us one living and inerrant Word for us to know Christ and to become progressively more like Him. But to be more specific about where in the Bible, compare everything to what Jesus did or said to do. You can almost always find a scripture to support what you believe. My family is constantly quoting Leviticus 19:28 to support their stance against tattoos. But they just skip right over Leviticus 19:27 with their non-bearded, non-side burned selves. So compare what you are doing to what Jesus said to do. Not a random Old Testament verse or something you found in Revelation. Not what a deacon or pastor or incredibly wise mentor is doing. Not what you feel like you should do. Are you setting aside time to pray the way Jesus did or do you just pray haphazardly when things get tough? Are you reading your Bible daily because you know you cannot live without it? You might like this post The Nine Best Bibles for Every Stage of Life. Are you proclaiming the gospel to all the people in your world? In Matthew 18:15, Jesus said, “If another believer sins against you, go privately and point out the offense.”He goes on to lay out a whole process for dealing with conflict among Christians. Are you following those guidelines when dealing with conflict? Are you forgiving others as Jesus forgave you with his death on the cross? Because here’s the thing – if you are doing God’s work, there are always going to be obstacles. Satan will throw them up often. Yes, I said Satan. He’s real. He’s roaming the earth like a hungry lion looking for someone to devour (1 Peter 5:8), and he will do anything to keep people from being reached with the love of God. So if you are out there, ministering, loving, and doing good works, there will be conflict. Jesus knew that Judas was going to betray Him. And yet, He loved Judas. He ministered to Judas. He prayed for Judas. All the while, knowing Judas would betray Him and He would die as a result of it. I am hurt by things that have been said about me and my family and none of those things have resulted in a mortifying and excruciatingly painful execution. But just the small pain that those words and actions have caused me, makes me want to quit ministering and hole up in a blanket fort eating pizza rolls. And that’s exactly what Satan wants. He wants to hurt me so that I stop teaching my class of sweet little 4th and 5th grade girls. And so that I will stop planning next year’s VBS. And so that I will stop helping in the church library. He wants me so upset that I’m even distracted during worship on Sunday mornings because he hates to hear the Lord praised. He wants us to only hear the negative, and to assume that every whisper is about us. He wants you and me to believe that our church would better without us. He doesn’t want me to listen to the positive. He wants to me ignore the teenager that was baptized last week and the five kids who gave their hearts to Jesus this week. He wants me to forget that my friend joined our church after years of not being a part of a church family. He wants me to look right past three of my precious children worshipping with all their little hearts. But I won’t give in. Of course, there will be seasons of life where ministry has to be scaled back. And that’s totally fine. It’s good. Focus on your family when you feel God calling you to take a break. But if you are quitting ministry in response to what another person has done or said or didn’t do or didn’t say, you are quitting for the wrong reason. And you quitting will not ultimately hurt the person that hurt you, it will hurt the lost and dying world. It will hurt the people that God ordained you to tell the good news. So I will continue to read my Bible, pray without ceasing, and tell others about Jesus and how He saved even a wretch like me. I am not better than the people causing me pain. 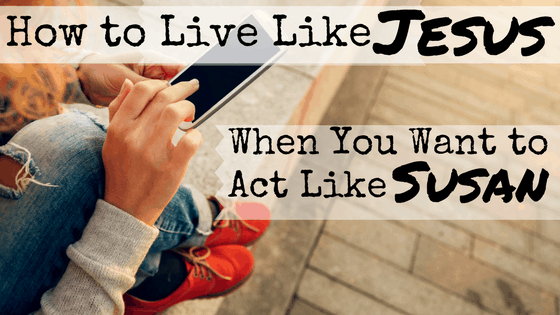 I am just like them – a sinner saved by grace living an abundant life that I don’t deserve. And if my story becomes anything other than that, I’ve failed. It is so difficult sometimes to remember why we are getting the trials we do and boy do they test our faith but when we come out the other side, we are stronger and better at dealing with those trials. The best of all we can then use those trials to help someone else through those even though it is so difficult for us at the time. We will persevere and continue to bless others! Right?! My first response to trials is to feel sorry for myself instead of viewing it as God refining me. But I’m working on that! Really good perspective for those like me that struggle with burn-out and over-committing in Jesus’ name. 🙂 I stepped down from everything this fall when I realized I did not have enough time to focus on my primary ministry- my 3 little kids. Now that I have had some time to catch my breath, narrow my focus, and recharge, the struggle for me is trying to discern what and where to jump back in and whether I am setting appropriate boundaries for my family or just excusing and over-spiritualizing selfishness. 🙂 Thanks for sharing about your journey! What an insightful and difficult thing to do! I sometimes struggle with viewing my calling as a mom as ministry. I often mistakenly feel like ministry has to be done outside the home, but you’re absolutely right. My primary ministry is raising my children. As you choose which ministry you are going to jump back into, I’d suggest you consider which one brings you the greatest joy. Preach it sister!!! Thanks for speaking truth especially about the context of using the Word. That has been my biggest passion for women to truly take everything they hear from speakers, pastors and books and compare it back to what the truth of the Bible says. I also learned that trials have ways of drawing us closer to the Father, even though at times I have tried to do it on my own and has never gone well. Halee, thanks for leaving a comment on my blog. I have enjoyed looking over your blog and getting acquainted with you and your family and your ministries. You remind my of my daughter: married to a pastor, English teacher, and busy, busy, busy mom! People like you have extra-tough assignments sometimes and my heart goes out to you and my daughter’s family and so many more. I hope you often hear God saying “Well done, good and faithful servant!” Be of good cheer, Halee, and have a blessed Christmas season. Linda, thank you so much. What an encouragement you are! I will do my best to be of good cheer because I am in the middle of a very blessed Christmas season. I wish you and yours the same! “Rattle the kingdom of darkness.” That is some powerful imagery and I love it. You’re absolutely right. I know that the harder I work to spread the love of Jesus, the harder Satan is going to try to stop me. Thanks for reading! This is great. It’s so hard to remember sometimes who we represent and to ensure we are acting like Jesus. Yes!! Especially when someone hurts me. Thanks for reading!